Bob Cury at RJC Yachts announces his recent appointment as central agent for sale of for the 2007 25.9m Horizon motor yacht, Debbie Lou. She represents the most highly customised 85' Horizon on the market and features a four stateroom layout, plus two crew aft, along with a fully enclosed skylounge, comfortable main saloon/dining area and large gourmet galley. Debbie Lou is powered by high-performance Caterpillar C32 engines at 1,825hp with an extended warranty to 2017. Additional large-yacht options include ABT zero-speed stabilisers, ABT bow and stern thruster, twin Kohler 32KW generators and a watermaker. 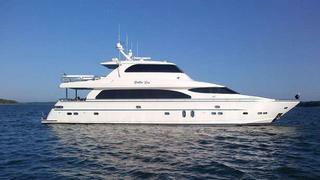 Currently en route to South Florida, Debbie Lou is asking $3.35 million.